Jonathan Millantz (left) and then-Lt. Phil Blanchard smile as an Iraqi detainee is forced to hold up a large board. Reveal has blocked the detainee’s eyes in this image to protect his identity. Former U.S. Army medic Jonathan Millantz shared this photo with me as an attempt to hold U.S. officials accountable. This is the first time it has been shown publicly. In August 2008, Millantz called and asked me to visit him in his hometown of Greensburg, Pennsylvania. He sounded frustrated – agitated, actually. He spent years detailing accounts of prisoner abuse and torture in which he and his fellow Army unit members had been involved. Nearly a dozen fellow soldiers backed up accounts of the unit’s prisoner abuse. Millantz had reached out to me again after the broadcast of a radio documentary on prisoner abuse I produced with reporter Michael Montgomery. By then, the Abu Ghraib prison photos from Iraq had spurred a military investigation. But Millantz said his photos were different from the Abu Ghraib pictures. He said his photos revealed widespread abuse and graphic torture – committed in the presence of officers. He hoped the force of these photos might finally prompt a response. Just before I arrived in Greensburg, Millantz’s family stumbled across a stack of his pictures, which shocked them. His family told me later that some showed detainees hanging from the bars of a jail and a soldier menacingly pointing a gun at a prisoner. And these weren’t the only disturbing photos. His family thought the pictures were just “a horrible reminder of the horrible things (he) went through” and threw them all away. Millantz said he understood and believed his family destroyed those pictures to protect him from revisiting grueling wartime memories. Yet he still was determined to find photos for me to validate his account of what happened. Together, we spent several hours rummaging through garbage bags in his family garage, trying to find the discarded pictures. We combed through his computer, hoping to locate files he sent to friends. But we weren’t able to salvage anything. The following day, we stopped by a house near Greensburg that belonged to Millantz’s friend John Hutton. Hutton had a number of photos and letters that Millantz sent him from Iraq. 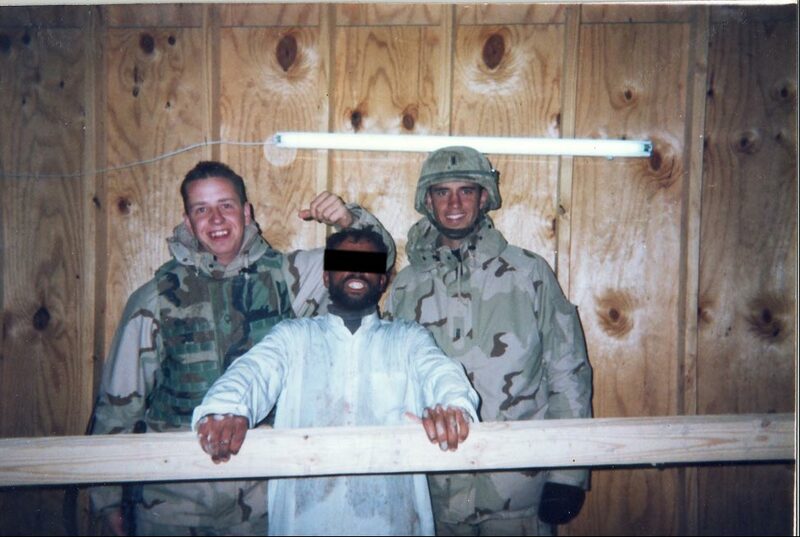 After the news about Abu Ghraib broke, Millantz asked his friend to keep the photos tucked way. Hutton stored the photos and letters in a locked box and told Millantz he could pick them up whenever he wanted. When we visited Hutton, he gave Millantz the few remaining photos he had. This photo was one of them. 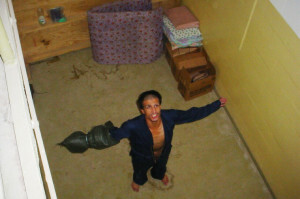 Photos documenting detainee abuse during the wars in Iraq and Afghanistan have been the subject of a decadelong fight by the American Civil Liberties Union to release hundreds, possibly even thousands, of additional photos. This month, the federal judge overseeing the case demanded that the government explain why it hasn’t released the photos. This photo doesn’t belong to the government’s files; it belonged to Millantz. The public might or might not see the additional photos of detainee abuse and torture. But now Millantz’s photo will be part of the public record. That’s what he wanted. We’re releasing this photo at a time when the issue of government torture is back in the news. It resurfaced again when the U.S. Senate released its report on the CIA’s secret interrogation and detention program in December. The report vividly detailed the kinds of torture techniques that CIA agents carried out, and were authorized by President George W. Bush’s administration. The report highlighted something else: no one involved in the CIA program has been punished for abusing and torturing detainees. The photo Millantz gave me shows him (on the left) posing with a lieutenant while a third man is seen grasping a large wooden board. He said the third man is an Iraqi detainee forced to hold up the board. Millantz and the soldier are smiling broadly, while the prisoner’s face shows a pained expression – his white shirt appears to be drenched in sweat. Reveal has blocked the detainee’s eyes in this image to protect his identity, because he is the alleged victim and because his identity could not be confirmed. It’s clear, though, that the photo has resonated for years with Millantz’s friends and associates. In 2009, I visited Hutton at his house, and he reflected on the images and letters. Keller said he had similar pictures as well but couldn’t find them. Like Millantz, Keller pointed to detainee abuse as the main source of his wartime trauma. And he expressed remorse. I also shared Millantz’s photos with another one of his Army buddies, Michael Blake. He recalled how Millantz coyly revealed the photos to him earlier. In Iraq, Millantz’s photos were a kind of war trophy. But he soured on the prisoner abuse and torture and talked about how he tried to stop it. When he returned home, Millantz was plagued with guilt about the role he played in the war. He was especially frustrated that nothing came of his efforts to halt the abuse. It gnawed at him. Millantz joined the antiwar movement for a time. Then he sought me out in 2006 and began to tell me his story. I suspect he didn’t tell me about his pictures at first because he wanted to protect his fellow soldiers – whom he still honored and respected – or because he still was uneasy seeing an old picture of himself abusing a prisoner. But he overcame his discomfort enough to push on and make one last push for accountability. That’s why he handed me this photograph in 2008. It was the last piece of evidence Millantz could give me to support to his story and to try to redress prisoner abuse and torture. Even though Millantz still was struggling with medical conditions, he sounded upbeat and positive, determined to overcome his problems and forge ahead. Two weeks later, Millantz died, at age 27, in his home of an overdose of prescription drugs. This story was edited by Robert Salladay and Julia B. Chan and copy edited by Nikki Frick.